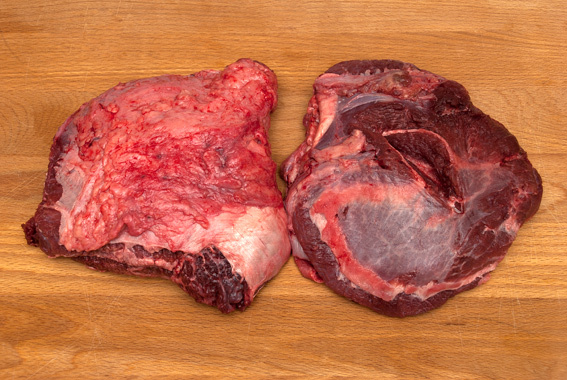 I was delighted when I walked into the butchers and they had about a dozen beef cheeks (also known as ox cheeks) on special offer. They weighed about half a pound each, so I bought two. The casserole I used wasn’t big enough to brown both cheeks side by side, so opted to do that in a large cast iron frying pan. Before I dealt with the cheeks, I chopped up my vegetables and started by frying the onions in some olive oil and a pinch of crushed chilli. 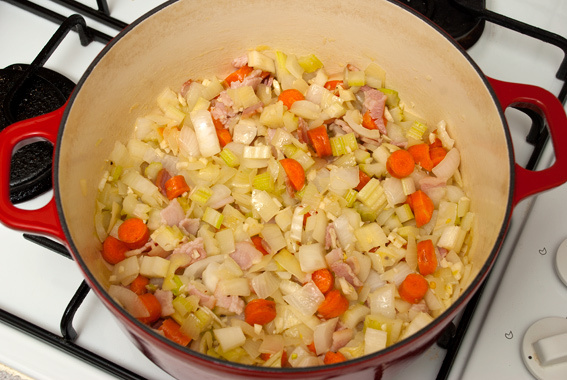 When the onions tuned translucent, I added the bacon, followed by the celery, carrots, garlic and mushrooms. Once the mushrooms had been coated in oil, I stirred in the anchovy paste, tomato purée, herbs (including the bay leaves), the stock and a glass of wine. While attending to the cheeks, I put the lid on the casserole and moved it to a preheated oven at 100º C.
The cheeks need to have any fat and the silverside (silvery skin/tissue) trimmed off before cooking (particularly visible in the left cheek at the top of the page). Once trimmed, the cheeks should be coated in flour (which has been seasoned with a spoonful of mustard powder). 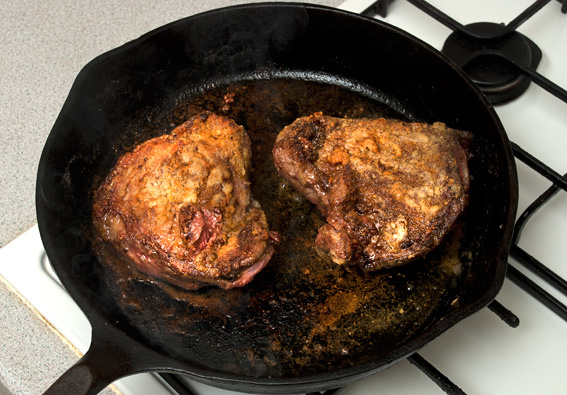 I browned the cheeks in a very hot (smoking) cast iron frying pan, with a mixture of goose fat and olive oil. 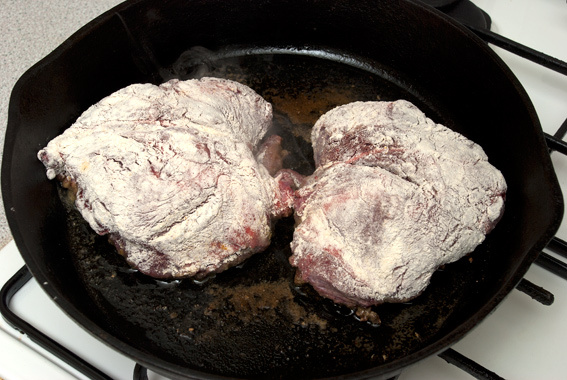 Once the cheeks had been browned on both sides, I transferred them to the casserole and deglazed the pan with some red wine and red wine vinegar. 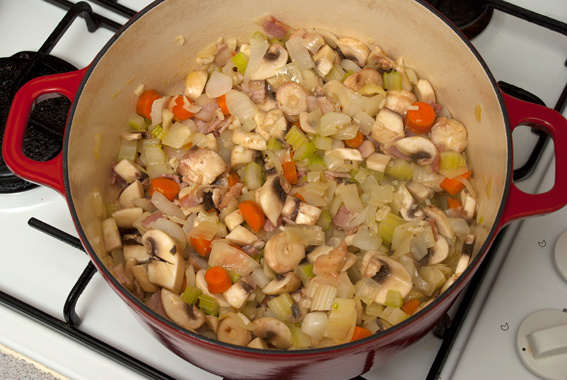 The deglazing liquid (flavours from the browning) went into the casserole with the cheeks and vegetables. I stirred in the remaining two spoonfuls of seasoned flour too, to aid in thickening the sauce (don’t worry about lumps, they will dissolve while cooking). 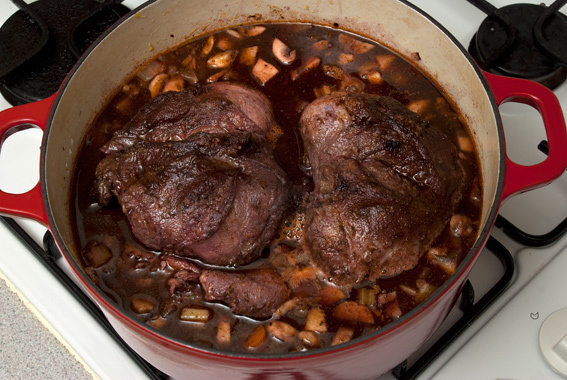 The cheeks need to be braised for at least 3 hours at 150º C.
After an hour, skim off any fat on the surface of the stock and have a good taste. This is a the time to add more purée, anchovy paste or vinegar if necessary. 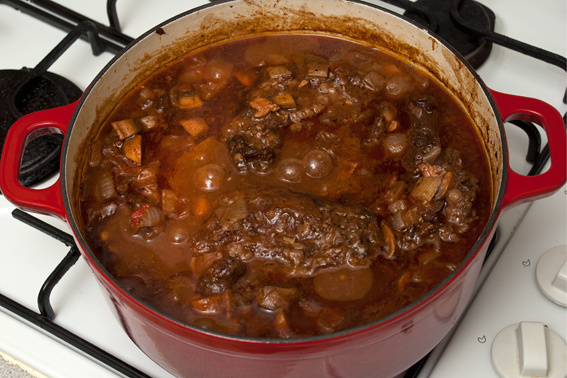 If the stock is a bit thick add a glass of red wine or stock. 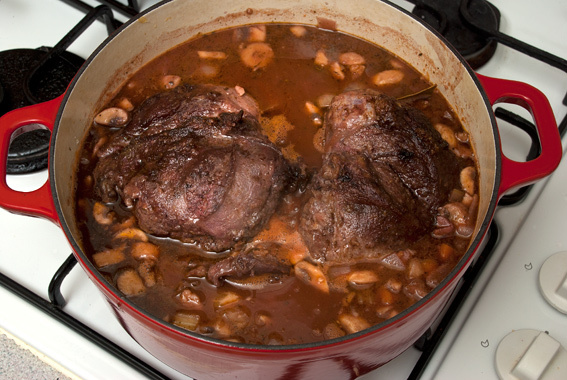 Toast Keith Floyd with a glass of wine or two while the cheeks cook for a further 2 hours. 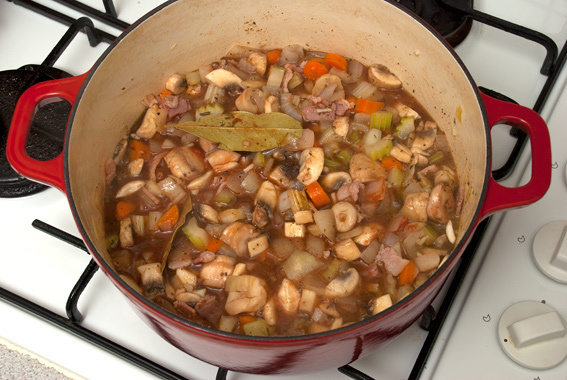 When ready, taste the stock again, it will have mellowed and might need a bit of seasoning (to taste). I stirred in couple of dessertspoonfuls of Balsamic Vinegar to enrich the flavour. Serve with mashed potato and the sauce from the casserole. 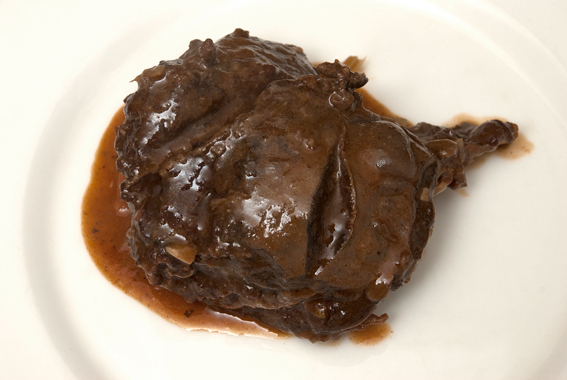 Beef cheeks cooked this way are very tender, like braised beef or salt beef. I saved my second cheek for the next day and it was even better than the first one, having sat in the stock for 24 hours. This entry was posted in Food, Meat, Recipes, Shopping and tagged anchovy paste, bacon, Balsamic Vinegar, bay leaves, beef, beef cheeks, butcher, carrots, celery, chilli, deglaze, flour, garlic, goose fat, herbs, Keith Floyd, McKanna Meats, meat, mustard, olive oil, onions, recipe, red wine, red wine vinegar, rosemary, sage, stock, thyme. Bookmark the permalink.